With all this heat, fruit goes ripe in no time – as much as Joao and I love bananas (and eat them on a daily basis) it is impossible to go through a bunch in 2-3 days. 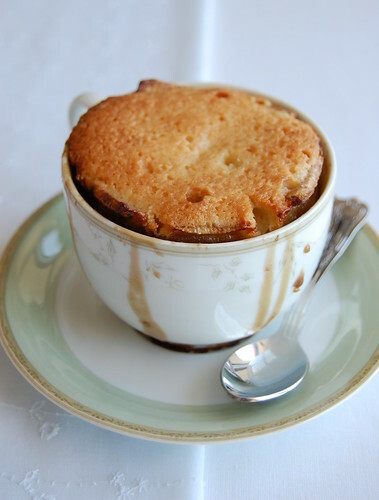 These teacup puddings looked adorable on the magazine – I cannot resist bananas and caramel together – and were also a perfect way to use the egg whites I had left from making ice cream. Preheat the oven to 180°C/350°F; butter well four 1-cup (240ml) capacity ovenproof teacups. Place the butter (21g), brown sugar and water in a small saucepan over low heat and stir until sugar is dissolved. Bring to the boil and cook for 3-4 minutes or until the sauce is syrupy. Set aside. Place slices of the banana in prepared teacups. Spoon half the sauce over the bananas, place the teacups on a baking tray. Set aside. Sift the flour, icing sugar and baking powder into a medium bowl and mix in the almond meal. Add the egg whites, vanilla and melted butter and stir to combine. 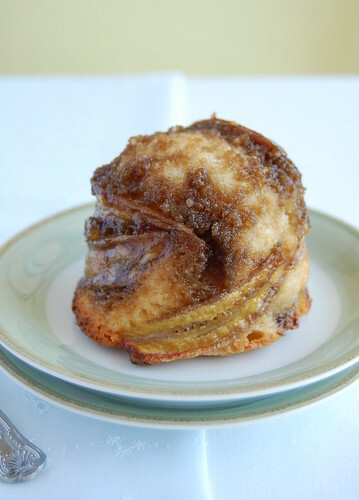 Spoon the mixture over the bananas and bake for 20 minutes or until golden and cooked when tested with a skewer. Invert the puddings onto plates and serve with the remaining sauce. I LOVE that they're actually in teacups! So cute. Completely adorable and yummy as usual! Oh my goodness these banana puddings look delicious! I love anything with banana in it. Oh my that looks good! Banana pudding sounds right up my alley! My sister freezes ripe bananas for future banana use. Since my hubby eats lots of bananas, I decided to write a whole post on all bananas have to offer, peel included! Oh yummy! What a clever and cute idea. A common way to use up bananas is to make banana bread which I do not like so this is definitely for me! Great idea! your banana pudding is gorgeous and looks just as tasty!! It is such a pity these cups cause for portion control, may I have 2 cups please??? ?It loos so yummee!! Emily, I love baking with banana, too. Alicia, I bet you'll love these! Janelle, I'll be freezing some next time, tks for the idea! Wizzy, I have made banana bread a couple of times, that's why I wanted something different. I'm glad you like it, tks! Half Baked, thank you very much! What a cute idea! But they seem to involve a bit of a dilemma - do you serve them in the teacup for full cuteness or turned out to show off banana/caramely beauty?! This is a good idea...such a delicious combination.